Just like your other home electronics, your DSLR (digital single-lens reflex camera) needs cleaning from time to time. Everyday use, especially outdoors, can attract a lot of dust and other impurities that find their way into the nooks and crannies of your camera. Plus, using the camera with dirty hands leaves oil stains on the lens and the camera body. If you’re an avid photographer, dust can also enter the camera body while you’re changing lenses and settle on the camera sensor. Not only does this hamper the functioning of your device but also leads to blurry or spotty images. Since DSLRs come with a hefty price tag, it is natural to feel a bit intimidated about opening up your camera and cleaning it yourself. However, if done the right way, camera parts are pretty easy to clean. Investing in a lens cleaning kit is the first step. To make the whole process less dreadful for you, we’ve described in detail how to clean a DSLR the right way (Lens, Sensor and, Body). The camera body is the easiest to clean. 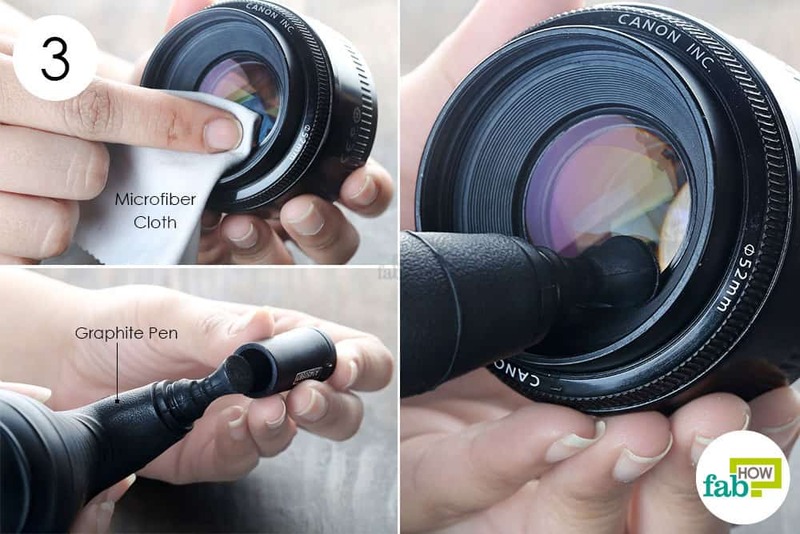 You can either buy an all-in-1 camera cleaner like the one we have used or a camera cleaning kit that contains a lens brush, a lens blower, and a cleaning solution. Instead of a professional lens blower, you can use any regular rubber squeeze bulb to clean your DSLR the right way. Caution: Do not spray any liquid directly on any part of the camera. Make sure your device is turned off before you begin the deep cleaning. Start by dusting off the dirt and grime using the soft brush. Clean the crevices on the mode dial and other buttons on the camera. Dust off the rim where the lens attaches to the camera body. Combine 1 tablespoon each of rubbing alcohol and distilled water in a container. Soak a cotton swab in the solution and use it to clean the dirt stuck around the function buttons and the dial. Pick up the dirt from the grooves on the camera grip as well. Use a clean microfiber cloth to wipe off fingerprints and oil stains on the LCD screen. If a single swipe doesn’t cut it, you can also use a lens cleaning solution. Spray a small amount of the solution on the microfiber cloth, then wipe the screen with the damp cloth. 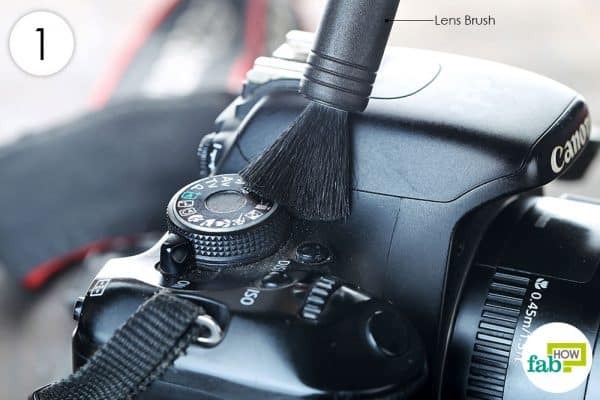 Use the air pump to remove dust from the viewfinder to clean your DSLR the right way. Camera lenses are the most susceptible to stains and fingerprints and should be cleaned with the utmost care to avoid any scratches. While the air blower is enough to disperse dust particles, it is also wise to invest in a professional lens cleaning pen that comes with a carbon cleaning compound. 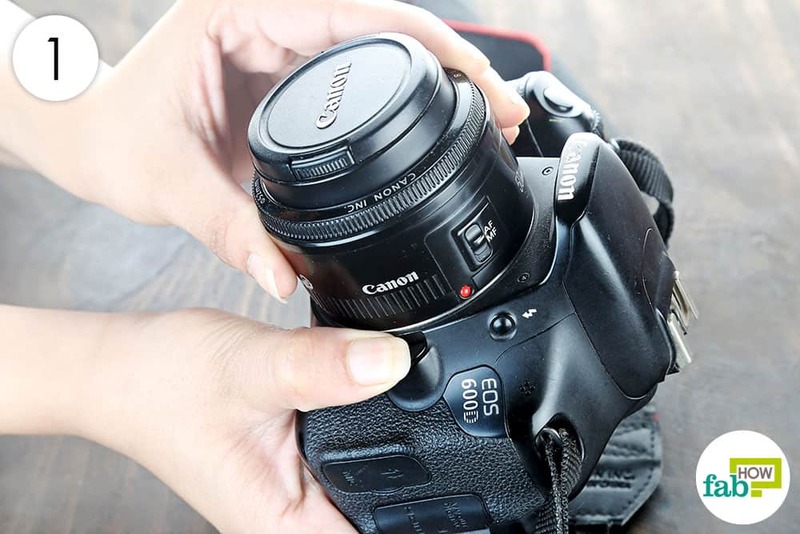 The carbon can easily remove oil stains from the lens without damaging the surface. Note: Do not use compressed air to clean the lens. 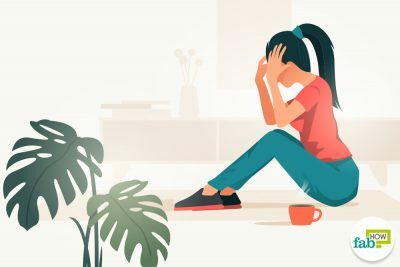 The pressure of the air can damage the delicate parts. Press the lens release button on the right side of the camera. Keeping the button pressed, rotate the lens clockwise or counterclockwise to detach it from the camera body. Hold the lens blower close to the front element of the lens and squeeze the pump repeatedly to dislodge dust particles on the lens. Avoid touching the lens with your fingers. Blow air on the rim and across the surface of the lens as well. 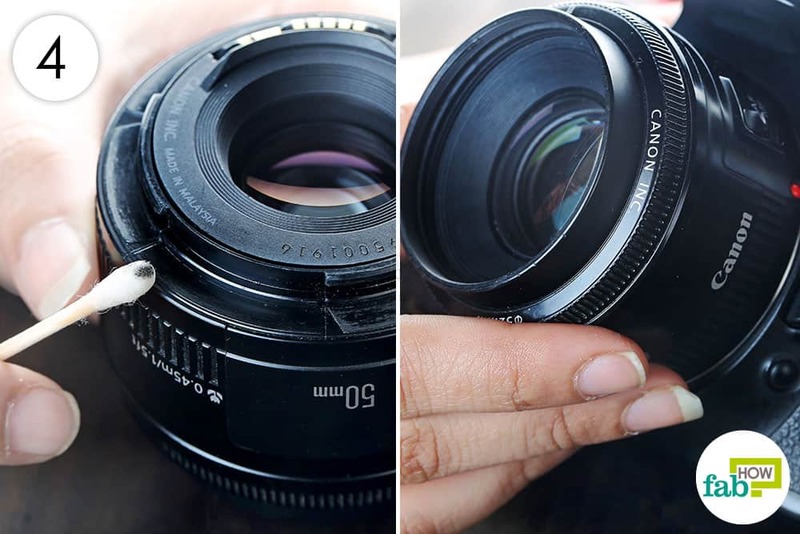 Clean the back element of the lens in the same way. While a blower should clean the lens sufficiently, if you still spot smudges or fingerprints on the lens, use a microfiber cloth to wipe it off. Wipe the lens in small circular motions starting from the center of the lens and moving outward. Avoid breathing on the lens, as it can cause condensation and lead to a moisture buildup. To clean your DSLR the right way, remove fingerprints or residual oil from your fingers, swipe the lens with the graphite pen that has a carbon-soaked polishing tip. Put the cap on the lens pen after use to prevent contamination. 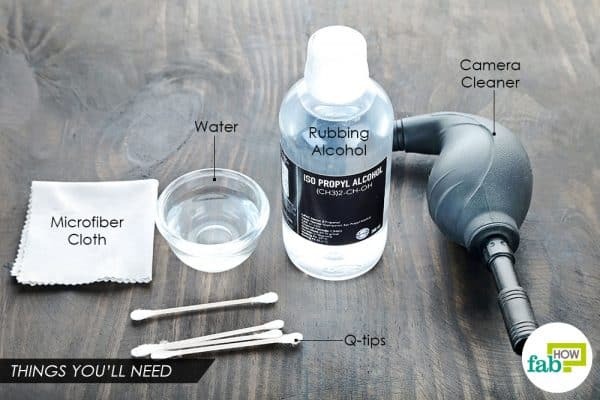 If none of this works, you can spray some lens cleaning solution on the microfiber cloth and wipe the lens with it. However, do not use the solution if your lens comes with a special protective coating. 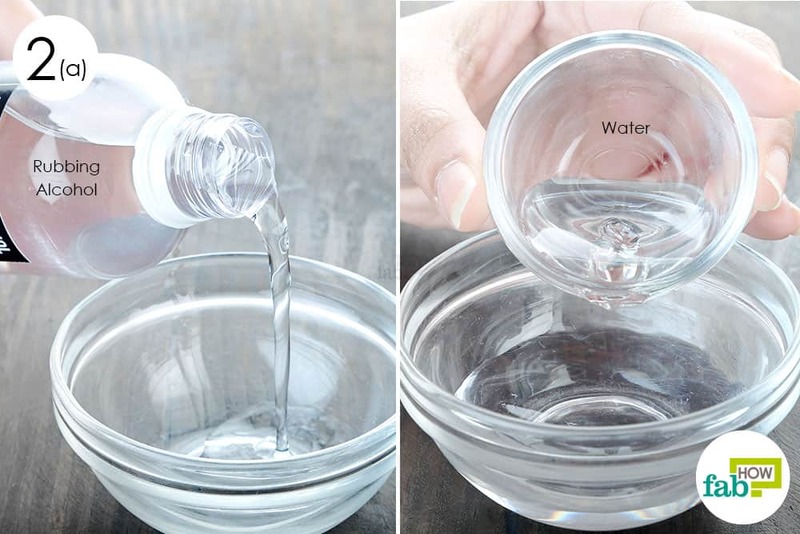 Soak a cotton swab in the cleaning solution prepared in Step 3 under the #Body Use it to clean the rings and grooves on the body of the lens. Slide the cotton swab along the lens mount as well to pick up the dirt. 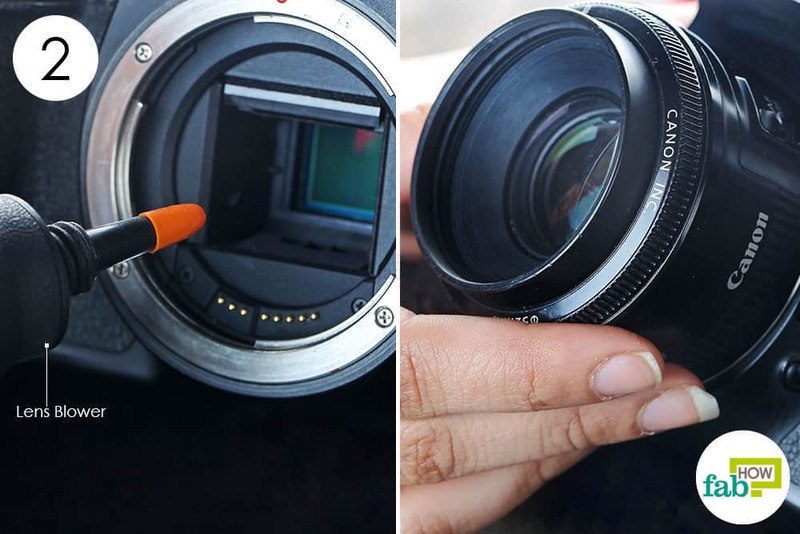 If you do not wish to clean the camera sensor, go ahead and reattach the lens. Set your camera on an f/16 or f/22 aperture and select the lowest ISO setting. Take a photograph of a white wall or white paper. Shake the camera slightly while capturing the image to blur the image. This will make the dust particles more prominent in the image. Load the image onto your computer and check for any dust spots in the image. If you see several spots in the image, your sensor requires a cleaning. Most DSLRs come with an auto-clean function, which makes the sensor vibrate at an ultrasonic speed to shake the dust off. If that doesn’t suffice, follow the instructions below for manual cleaning. Note: Make sure that your camera is sufficiently charged before you begin manually cleaning the sensor. You will need to keep the camera on to expose the sensor. Remove the lens before you proceed with cleaning the sensor. Go to the settings menu and select the “Sensor cleaning” option. Then, select the “Manual cleaning” option. Select “OK.” As soon as you press “OK,” the mirror inside the camera will lock backward and expose the sensor. 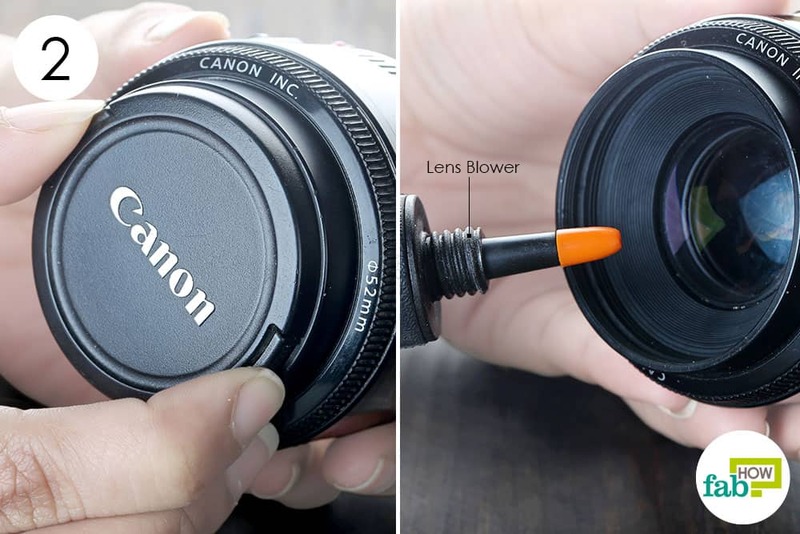 Use the lens blower only to clean the sensor. 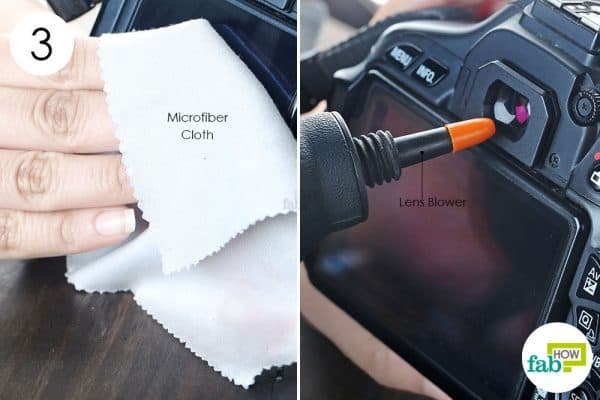 Do not try using the lens brush or any other cloth to clean the sensor, as it can damage the delicate surface. Squeeze the blower 2 or 3 times to dislodge any dust particles from the sensor’s surface. If a dust particle is still stuck to the sensor, use a cotton swab to gently pick up the dust particle. Do not try to wipe the sensor with the swab. 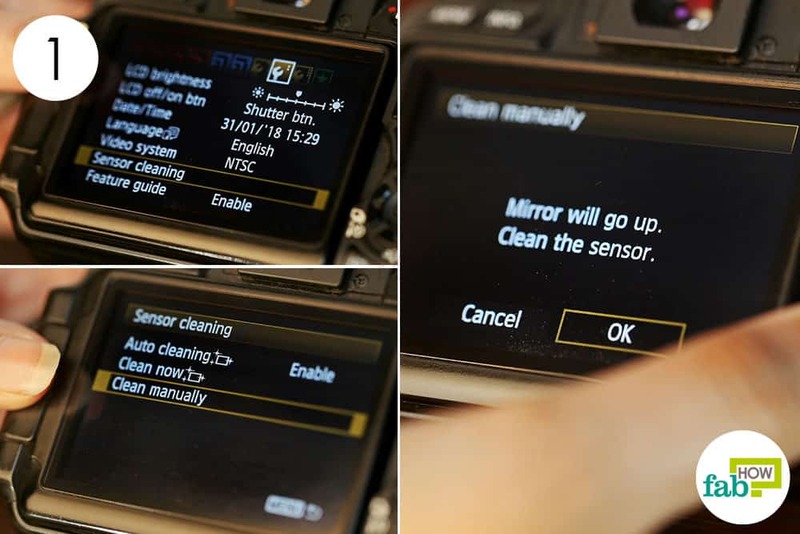 Once you’ve cleaned the sensor, switch off your camera to release the mirror. If the above steps have not successfully cleaned your camera sensor or the lens, it is best to take your camera to a professional. When not in use, always keep the lens covered with a lens cover. Always store your camera in its case when not in use. Do not use a T-shirt, paper towels or tissue to clean the lens. Do not touch the bristles of the lens cleaning brush, as the oil from your skin could transfer onto the brush. To keep your lenses protected, invest in an ultraviolet (UV) filter and keep it attached to the lens at all times when shooting outdoors. Keeping your Macbook or laptop keyboard clean and dust-free is also extremely important, else it easily becomes a hotbed of bacteria. You can also clean your iPad or iPhone screen with the cleaning solution of rubbing alcohol and distilled water.